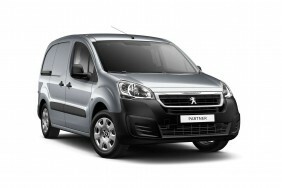 Great Peugeot Partner van Leasing & Contract Hire Deals. Large, well built, economical and with more than its fair share of clever design solutions, Peugeot's Partner is a tough compact van to fault. It doesn't handle with any particular agility but it's comfortable, the model range affords lots of choice and it's not bad looking. Here we look at the improved restyled Euro6-compatible version which offers a sleeker look and lower running costs from its frugal BlueHDi diesel engine. Our Peugeot Partner Lease Deals. Peugeot's improved Partner van has become cleverer and more sophisticated whilst still retaining the practicality that has made it an LCV favourite. The latest generation BlueHDi diesel engine option should make a big difference to running costs and if you get yourself a version with the clever 7-inch telematics screen inside, then your little compact van will feel very up to date indeed. The French brand has obviously put plenty of thought into the design into this enhanced Partner and it's backed the hi-tech stuff up with slick features intended to make the working day that little bit straightforward. Most of them appear to do the job too. As a result, bearing in mind this vehicle's large carrying capacities and competitive payload, it's now more than ever true that Peugeot's compact van should figure on any sensible shortlist if you're shopping in this segment. Businesses want small vans because the traffic's a pain in the proverbial and there's nowhere to park at the best of times. The problem is that these same businesses also want their small vans to carry lots of stuff so they can make more deliveries in one day and take more equipment or cargo on a single trip. Such a set of requirements is always going to fall foul of the laws of physics at some stage but Peugeot thinks it's pushed the envelope pretty far with their rejuvenated Partner LCV. Think of it as a little big van. All the leading van makers used to offer one size of compact van but now the majority have two - or at least two wheelbase options on the same model. The Partner is Peugeot's largest little van, with the little Bipper sitting below it in the hierarchy. It's a set-up that serves to give operators more choice, making it easier for them to get a van that precisely meets their needs. The Partner's remit is to cater for operators who want the lithe driving dynamics of a compact van but need to carry quite a lot of cargo with it. How does it do? Let's find out at the wheel of the latest sleeker-looking Euro6-compatible version. The Euro6 engine range headlines with Peugeot's latest generation 1.6-litre 100bhp BlueHDi diesel unit, though there's also still a 1.6-litre 16v VTi petrol variant for the few that want it. Go for the BlueHDi diesel and there's the option of a clever automatic ETG6 gearbox, which would be a boon for urban operators. It's also worth pointing out that Peugeot's older Euro 5 diesel powerplants, the 1.6 HDi 75 and 1.6 HDi 92 units, will continue to be available for a limited period. The 92bhp version can be ordered in ATV guise with the brand's clever 'Grip Control' system if your work takes you through slippery surfaces. If you don't want an engine at all, then you'll be looking at the Partner Van Electric version, with zero emissions, delivering 67hp and having a potential range of 105 miles. As before, the Partner's underpinnings are adapted from those of the brand's first generation 308 family hatchback. There's a Macpherson strut type set-up at the front and a more rudimentary torsion bar at the rear with anti-roll bars at both ends. The effect is a ride that's on the soft side making for smooth progress but a lack of body control when cornering. The Partner handles reasonably well with 11m turning circle in the shorter model helping manoeuvrability. The gear lever is perfectly sited in its dash-mounted position but, although pleasantly light, the shifting action is looser than many would prefer. This improved Partner gets a restyled front end, but bigger changes are found inside where there's the option of a freshly designed telematics system with a smart 7-inch colour touchscreen incorporating the option of satellite navigation. This system also gives you Bluetooth, a USB port, an aux-in socket, voice recognition and a MirrorScreen function that duplicates the functionality of your smartphone onto the display. On to practicality. As before, the Partner's cab area is positively loaded with storage options. From the dash-top cubbies to the door pockets and the overhead shelf, places to put things are in abundance. The dash is tall and vertically stacked forming a barrier between the driver and the windscreen but visibility is fine out the front and down the sides. Peugeot have used good quality plastics throughout and the interior feels as though it will last. There's also plenty of adjustment to the driver's seat and steering column, so most people should be able to get comfy. Buyers can opt for a two-seater cab layout or take the Multiflex three-seater option. This adds a third berth in the middle but it's extremely narrow and has restricted legroom courtesy of the dash-mounted gear lever. Your colleagues won't thank you for assigning them to sit in it for any length of time but the Multiflex system comes into its own with fewer passengers on board. That middle chair can fold down to make a desk or the outer one can drop flat to the floor, increasing cargo space. To meet the differing needs of business users, the Partner van range offers a wide selection of bodystyles, the choice being between two lengths (the L1 at 4.38m long and the L2 at 4.63m), plus a crew cab version with a folding bench seat in row two. There's also a floor cab for body converters. As for competition, well the Partner must battle it out against some established names at the larger end of the compact van market. Volkswagen's Caddy, Renault's Kangoo and Ford's Transit Connect are the big names it must compete with but it also has the added problem of its sister vehicle, the Citroen Berlingo. With very little other than the badges differentiating Berlingo from Partner operators might have a tough choice on their hands and decisions may come down to the quality of dealer support. Equipment levels are reasonable, with even base variants getting features like a CD stereo, power steering, a ladder frame protector for the driver's seat and electric front windows. Standard safety stuff runs to ABS, emergency braking assistance, ESP with traction control, Hill Start Assist and Direct under-inflation detection, using a pressure sensor fitted to each wheel. As an option, buyers can specify Active City Brake, a system which scans the road ahead for potential collision hazards as you drive at urban speeds. Further up the range, there are features like cruise control, a speed limiter, rear parking sensors - and even a reversing camera. There's also the option of a Grip Control system that provides enhanced traction. This allows the vehicle to continue to make progress on roads or tracks and surfaces with low grip. Not The Van For You? Let our friendly experts help you find the perfect van by contacting us today.